I'm trying out a great window management tool: the Dock in VisualTooltip. 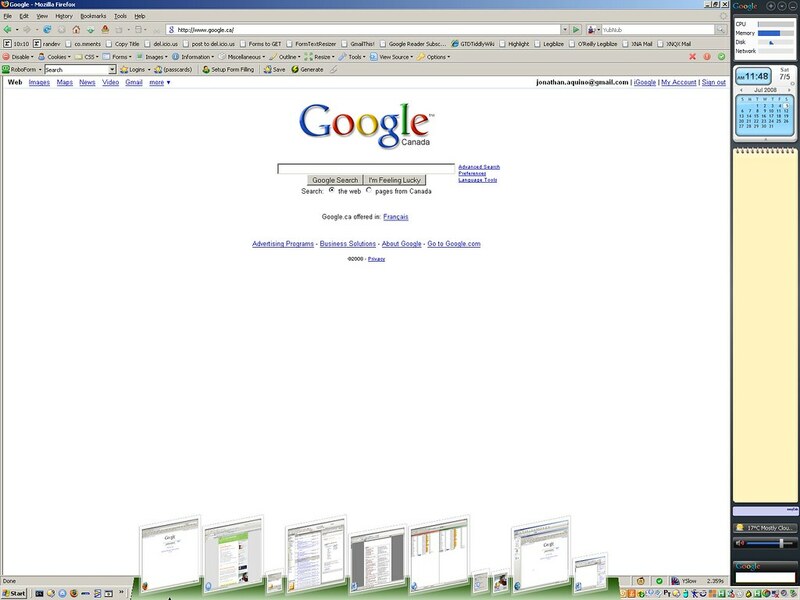 It displays thumbnails for all open windows in a dock at the bottom of the screen. And there's a useful "Sort thumbnails by window order" option, which keeps the thumbnails ordered by their position on the window stack: the top window appears first, the window below that appears second, etc. This is fantastic - it means that the 3-4 windows you are working with always appear on the left. I like this better than Expose and Alt-Tab because the thumbnails are always visible - you don't need to switch to a different mode to see them. posted by Jonathan at 7/05/2008 11:49:00 a.m.
By Jonathan, at 7/07/2008 9:42 a.m.